Received this recipe in an email from Kraft Foods. -MIX first 3 ingredients until well blended. 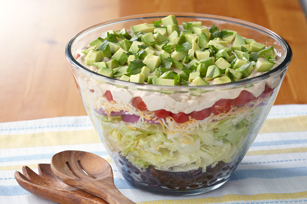 -LAYER beans, lettuce, onions, cheese and tomatoes in large bowl. -SPREAD dressing mixture over salad. Refrigerate 2 hours. -CHOP avocado; spoon over salad just before serving. Sprinkle with cilantro.